When James Webber was granted the Tocal land in 1822, there was a new policy to assign most convicts to settlers to save the Government money. Previously most convicts worked in Government gangs and were 'on the stores', indicating that their food and clothes were provided by the Government. James Webber received Tocal on the condition he maintain one convict 'off the stores' for every 100 acres granted. This meant he had to feed, clothe and house the convicts himself. Webber could also buy at a nominal price one cow from the Government herd for every 100 acres he received. In 1822 Webber applied for 1,500 acres and 15 convicts but within a few years he had 3,300 acres and 33 convicts 'off the stores' at Tocal. Webber also received his entitlement of cows from the Government herd. I was favoured with your letter of the 22nd inst. & in Reply beg to say that I propose taking 15 Men off the Stores. 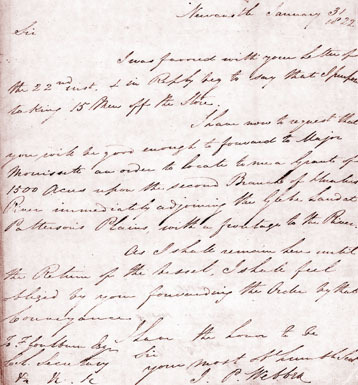 I have now to request that you will be good enough to forward to Major Morisset an order to locate to me a Grant of 1500 Acres upon the second Branch of Hunters River immediately adjoining the Glebe Land at Pattersons Plains, with a frontage to the River. As I shall remain here until the Return of the Vessel, I shall feel obliged by your forwarding the Order by that Conveyance.